In 2002, then-Nebraska Senator Chuck Hagel was the only member of the United States Congress to receive a special invitation from former President Jimmy Carter to join him on a trip to Cuba. Mr. Hagel chose not to go, citing scheduling conflicts and concerns over the optics of such a trip. But according to a 2002 article Breitbart News obtained through the Omaha World Herald’s archives, Mr. Hagel went on to say this: "What Jimmy Carter's saying ... is exactly right: Our 40-year policy toward Cuba is senseless," Hagel said. "It's outdated, it's irrelevant and it just doesn't fit. We should be wise and be trying to enhance America's position with peoples of the world." In addition to support for Mr. Carter’s Cuba policy, Mr. Hagel said that the way to undercut Cuban dictator Fidel Castro was to lend him access to the world’s largest market, the United States: “If you start opening trade with Castro and opening a dialogue and a relationship, I think that cuts directly against his interests," said Mr. Hagel. Asked whether such a move would merely strengthen the power of Castro’s regime, Mr. Hagel replied: "That's just not true," he said. "That's the same tired argument that everybody uses." Both Reuters and the Miami Herald report that Cuban Security agents broke their previous records of government political repression in 2012 with 6,602 confirmed detentions of political dissidents. In 2011 there were 4,123 confirmed political arrests which was even higher than the 2,704 arrests from 2010. Both Reuters and the Miami Herald based their data on a 2012 year-end report from the Cuban Committee for Human Rights and National Reconciliation. Add the Cuba embargo to the growing list of hot-button issues Defense Secretary nominee Chuck Hagel may have to address during his impending confirmation hearings. Hagel first wrote to President Clinton in 1999 after Clinton announced he was loosening restrictions on humanitarian aid and travel to Cuba, calling it a "good first step." But Hagel added "he should have done more." When calling for a bipartisan commission to review the U.S. policy toward Cuba, Hagel called it "outdated and ineffective, and not relevant for the next century." In 2001, Hagel and former Connecticut Senator Chris Dodd introduced a bill to open the Cuban market for the export of American agricultural and medical products. "The exports of American food and medicine is not just an economic issue, it is also a humanitarian undertaking. Blocking exports in these commodities harm the health and nutrition of the people of the sanctioned nation. 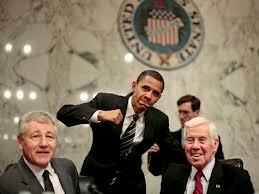 It does nothing to harm governments and the government leaders with which we disagree," said Hagel. "Passage of this provision, and the one last year, acknowledges what most Nebraska grain and livestock producers have always known – when the United States places unilateral sanctions on other nations, American producers are hurt, not the sanctioned nation," Hagel continued. In March 2003, Hagel and Senator Max Baucus introduced a bill known as the United States-Cuba Trade Act of 2003 that sought to lift the embargo. The bill, which died before gaining much traction, said, "the continuation of the embargo on trade between the United States and Cuba that was declared in February of 1962 is counterproductive, adding to the hardships of the Cuban people while making the United States the scapegoat for the failures of the communist system." In a letter to colleagues on the bill, Hagel wrote "trading with and traveling to Cuba does not represent an endorsement of the Castro regime. To the contrary, it helps ensure that children in Cuba will be afforded more opportunity than their parents to have lives that are more full, free and just by opening Cuban society to democratic ideals." In October 2003, Hagel succeeded in co-sponsoring an amendment that passed which ensured Americans were not punished for traveling to Cuba to do business or study. 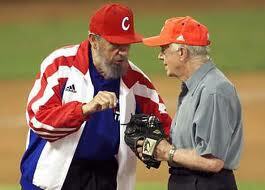 "It does not serve U.S. interest to isolate ourselves from the people of Cuba. The current U.S. policy places our farmers, workers, and companies at an international competitive disadvantage. Nebraska’s agriculture producers should have open access to the Cuban market," Hagel said. Hagel's work to lift the embargo could rankle some Senate Republicans, who maintain the U.S. should not trade with a country that is under the rule of a Communist regime. One leading Republican on these issues, however, held his fire when asked by BuzzFeed about Hagel's position. A spokesman for Florida Senator Marco Rubio commented said, "We have a process for nominations, and Senator Rubio won’t prejudge these nominees. Senator Rubio hopes he will be able to meet with Senator Hagel prior to his confirmation vote. We’ll have questions about some of Senator Hagel’s past positions, including sanctions on Iran and promoting democracy in Latin America, since that’s long been a priority for Senator Rubio."